Hugh is a composer and producer. Since graduating from the Conservatorium of Music at Melbourne University, where he received a High Distinction for his final folio, Hugh has forged a successful career writing both art and commercial music. 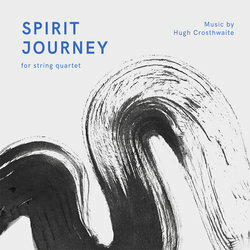 Hugh's compositions have been premiered by some of Australia's finest musicians and his recordings have appeared on Triple J, PBS, Triple RRR and 3MBS among others. Hugh has been the recipient of generous patronage and grants. In 2017 Hugh was awarded a grant from Creative Partnerships Australia as part of their Match Lab program. In relation to post-tertiary education, since graduating Hugh has dedicated himself to the private study of composition and orchestration. His skill has been noted in reviews, most notable of which was Clive O’Connell’s 2016 review that his music was ‘rational’, ‘well organised’ and ‘deftly orchestrated’. Since early 2016 Hugh has been fortunate to have the guidance of Andrew Ford as a mentor and tutor as he continues to develop my harmonic language. Peaks and Vales is the third movement of Spirit Journey. It is inspired by the act of facing and rising above adversity. It also represents the solitude found in the the completion of a great journey or transformation.